Joining LOCH SHIRA in the Garvel Drydock on Monday was the Sligo, Ireland, registered mussel dredger RONA. The hull for this 40 metre long vessel was built, of steel, in Poland and towed to Holland for outfitting, which was carried out by Scheepswerf Gebr. Kooiman at Zwijndrecht. Some of the steelwork was actually formed in Holland before being sent to Poland for assembly. Her upperworks are of aluminium. Delivered to Atlanfish in June 2005, RONA has a gross tonnage of 343 tons. She cost €3.1 million to build, and was partly funded by Irish State and EU grant assistance. An article about the vessel appeared in the July 2005 issue of 'Fishing Boat World'. 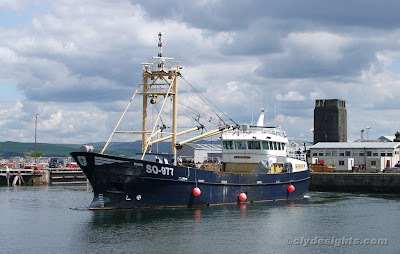 for some related images of same mussel dredger.